Roxie came into UYR when her owners dropped her off at a high-kill shelter because they apparently couldn't take care of this sweetheart anymore. What a precious little girlie who loves to go for long walks, jumping up and down like a pogo stick when Foster Mom brought out the leash. She also loved to give puppy kisses and go for car rides......and she had so much love to give to her new family. And she is certainly lovin' life now that she has a forever family. There's almost always someone home with this little princess who spends her time being loved on by her new mommy, her grandparents and her skin brother! Roxie will never ever be homeless again. 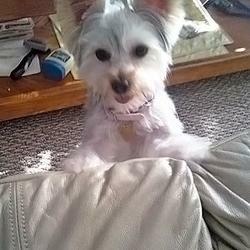 Have a wonderful life, little Roxie! Hi, Sonny is a very good little boy! He loves to play with Skittlez! Skittlez loves to play and now is the one starting the play! He is giving a lot more kisses since we've had him and when we say the magic word (potty) he spins in circles and is very happy! He jumps in the air and when he wants to play but we are laying down or sitting, he takes his bone and will fling it in the air or moan and bark for attention. Sonny makes us happy and is fitting in very well. The groomer said that when Skittlez was on the grooming table and Sonny was in the cage waiting for his turn, he wouldn't stop barking because he is so attached to Skittlez. He has a terrific personality! When we brush him he loves to hold the brush in his mouth! Brittany - thank you for giving us Sonny - he is a pleasure. Hi! It's me, Jack! I used to be called Jackey, but now I'm "Just Jack". Sorry this Happy Tails story is coming so late. I've been so busy having fun with my new family. 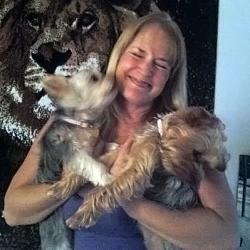 I am sooo happy with my FURever mom, Marlene, and my fur-sister, Barbie. I just love my new life. Mommy says I am such a good little boy. She loves me to pieces and even takes me to work with her sometimes. Everybody at work loves me, too, and thinks I am so cute. I make sure she tells them I was rescued by UYR. Thank you UYR for saving my life and finding me such a great mommy! Hello, Just wanted to say Hi & Let You Know that the Girl's are doing Great! Jaide's The protective Big Sister, Whenever Another Dog is around. Daizee's making great progress with her Housebreaking. During Fay last week we put fake grass in the screen porch area & She went there it was awesome. We Couldn't be happier. Thank you All so much Aren't they just Gorgeous in These pictures?? When I first read about Molly, my heart went out to her. Being a rescue, I wasn't sure if I could handle it. So, after much thought and prayer, I decided to adopt her. 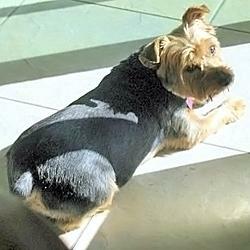 She shares my home with India, my other yorkie. We go for daily walks around the neighborhood and she loves to ride in the car. Sometimes she looks so intently at me I wonder what she is thinking. 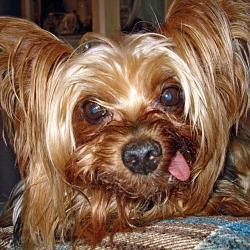 If anyone is contemplating adopting a rescue, my advice is give a yorkie a chance at a good life. I am glad I did! Hi, I just wanted to let you know things are going well with Rose. She is coming out of her shell and is getting along well. 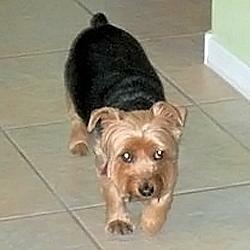 She and her brother Dinky still have a way to go, but are making progress. I'm sending a few pictures of the kids. 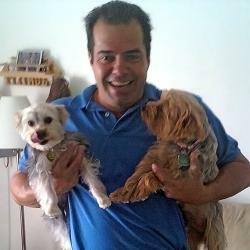 One is of me with Dinky on the left and Rose on the right. Another is of Rose and the last is of Rose and Dinky having fun tearing up papers :) Rose is a great dog and I would encourage anyone to consider adopting a rescue dog. Lucky wrote to UYR to tell us how he’s doing in his new home! I am very happy with my new family. We are having a great time. I have been playing with all my new toys. My favorite is a blue lobster. I guess my new mommy, Lauren, is spoiling me. On second thought she just loves me sooooo much J!! Thank you for helping find such a loving family. I couldn't have done it without you. I have learned to sit, and lie down, but I just don't get "roll over" yet. I have been going for walks and riding on a floaty in the pool. This is the life. My allergies are doing great. I have only scratched once, well maybe twice, but I feel great. I am sending a few pictures so you can see how I am doing. Tell all my friends I love them. 08/10/08: From Dude's Forever Mom....It is hard to believe that it has been over 2 months since little Dude came to live with us. We love him so much. He is such a special little guy. I cannot believe that anyone could consider him a lost cause. He is doing so very well. He trusted us more each day and he very rarely shows any sign of aggression. The last time he went to the groomer, she told me he was a different dog than she first met. Gizmo, his sister, causes him the most grief. She is still learning to play with him and tends to bark a lot. He has been very patient with her. I love to watch them chase each other around the house. I want to thank UYR and TN Mom Kathee Stallings for giving us the opportunity to have him in our lives. We are glad that our home is his forever home. Rockee’s Original Bio 05/01/08: Hey everyone! 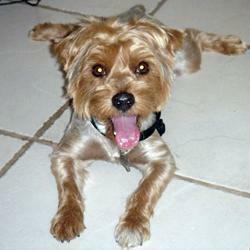 My name is Rockee; I was rescued by UYR from a high kill shelter in So Florida. I am only 2 years old and weigh just 6#. My FM named me Rockee because I'm blind in one eye and she thought I probably have had a 'rocky' life up until now. I was being treated for conjunctivitis at the shelter, but when I went to see UYR's vet, she said that I had a puncture wound to my left eye and because it was left untreated, that eyeball is a little smaller and I am blind in that eye. It's no biggie! I get around JUST FINE! 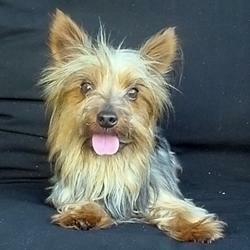 :) I'm a cuddle-bug and love to sit on your lap. 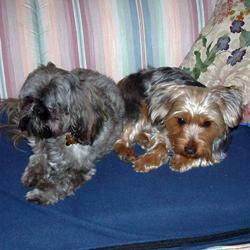 Harry & Rockee were adopted into their Fur-ever home on May 9, 2008 and Rockee was re-named “Max”. HARRY: So... Max, what is it you like best about living in Orlando? MAX: I thought we’d see “Mickey” more, but I really like our new home and having two Daddies. When one doesn’t give me attention – I just go to the other! 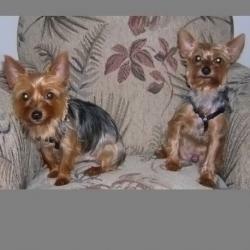 HARRY: I’m just glad our Foster Mom had us both so they could fall in love with us at the same time!! MAX: She’d be proud that we’re going to school every Saturday at Petsmart, so hopefully we won’t have to wear belly bands anymore, and that we walk our Dad’s every night (except when it rains – we have to keep our good looks!). HARRY: I like all the treats we get when we’re good and all the new tricks we’re learning!! MAX: Yeah, that “paw” one was easy!!! Maybe one of these days I’ll give one of them a kiss and really shock them!! HARRY: I kiss them all the time – I love our new home. They’re just wild about me!!! MAX: I know – they like me a lot too! Ever since I saw them, I’ve had my eye on them!!! HARRY/MAX: Thank you UYR for blessing us with such a nice home!!!!! 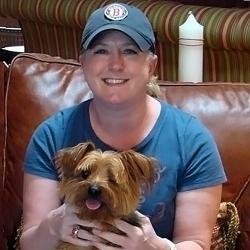 A Happy Tails note to Mr. Jingles former foster mom. Posted 06/13/08: Rene, Jingle, now owns the neighborhood. I don't put a leash on him unless we are on our 3 mile jaunt every day. His weight is down and his activity level is higher... We took the Kennel and put it away as he never went in it....He goes in for a grooming and nail trimming every two weeks and he's going to have a teeth cleaning. My neighbors love him as I let him come out with me to put out the trash and he goes to visit. He returns as soon as I call him and he loves to Sun bath in the back yard. He's also be come a Soap Opera watcher with my wife. He's like a God sent to the entire Family...Everybody volunteers to walk him....Last, he only eats a half cup of Royal Canine and as a treat we give him Vita Bone treats. Little Phoebe was brought into the shelter a matted mess, there were sticks and twigs coming out of her severely neglected and overgrown coat. 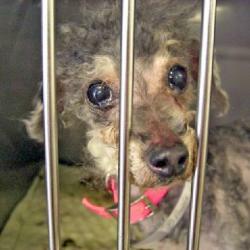 The shelter staff decided the humane choice would be to shave her to the skin. 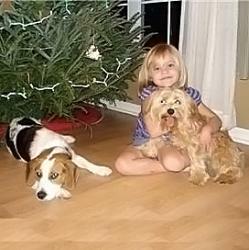 Phoebe lived in a loving UYR foster home for 2 months, where she learned how wonderful it was to be a beloved companion again, and most importantly, she also learned how much she was loved. 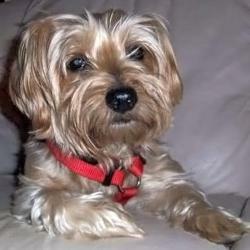 Then, a kind gentleman who had an abundance of love to share, decided to take a chance on a sweet little yorkie-poo who was in need of a good home. Fast Forward - one year later.....Phoebe has a brand new name to go along with her new look - her adoptive Dad decided that she was a true gem - and named her "Ruby". Look at this little princess now - she is as beautiful on the outside as she always was on the inside. Her previously matted and neglected coat has grown in, and her beautiful appearance now matches her beautiful personality. Please let Phoebe/Ruby's story inspire those looking to adopt to take a chance on a shelter or rescue dog, one like Ruby that might be a "work in progress." 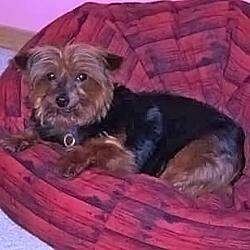 It is likely you may find a hidden treasure -a true gem - just like this precious little girl who now is adored by her new dad and her fur-brother and everyone who knows her. Ruby, you will never be forgotten by the Foster Mom who pulled you from the shelter nor by the Foster Mom & Dad who uplifted your spirit and showed you what unconditional love is.......we hope that your story will be inspiring to others who may give another little matted rescued dog a chance............have a happy life, sweet girl. 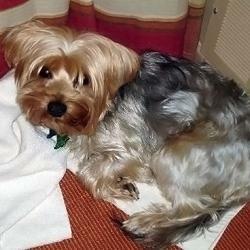 Listen to Baylee sing for his new family! Romeo, now known as Watson, came into UYR because his former family was unable to spend enough time with him and they wanted a better home for him. 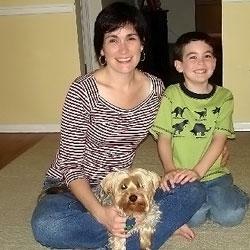 He was a very sweet little boy who suffered from mild separation anxiety because of his history of being left alone so much. Below is an email from Watson's new family - sounds like he's living large - in Germany! Watson is doing fantastic; he has been with us now for 15 months and is such a wonderful little guy. We moved from Tampa to Germany last summer and will be here for another year. We live in a nice house that has a fenced in backyard. The living room has big picture windows that look out into the yard and Watson and his brother Webster spend hours looking out the window; if they see something they want to bark at, they run out the dog door. Just behind the yard is the forest where we take Watson and his brother Webster on nice walks. The neighbors all take their dogs for walks through the woods, so that gives "the boys" plenty to bark at throughout the day. The two of them get along really well and are fun to watch and be around. Watson likes to be around someone, so he will follow me around the house, or his his dad if I am not home. He takes naps on the couch either on a blanket or propped up on a couple of pillows (his favorite) and likes to sleep curled up on the bed at night. He has been a wonderful addition to our family. Thank you UYR for allowing us to adopt this precious little boy! 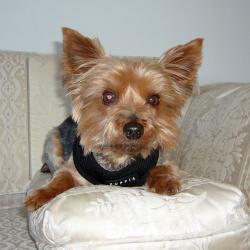 Khaki's forever mom writes......Khaki is such a sweet little teddy bear. He loves to play with his big brother Scamp. He barks at him to wake up and play when he is bored and chases him around the Christmas tree. He loves going on walks, to the dog park, playing with squeaky toys, and of course, snuggling. He does not have a mean bone in his body and loves anyone he meets whether they are people, dogs or even cats. The only thing that seems to bother him is when squirrels invade his yard and he has to defend his territory. We are so lucky to have met him and he is a perfect fit into our playful family. Brody has been with me now for just over 2 years and I couldn't be happier with his progress. Having only one eye does NOT slow him down even a little bit. 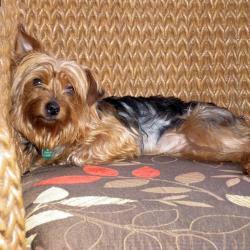 He's a very active little boy who loves to chase squirrels in the yard, go for long walks to nowhere or to the big Avenue to do our shopping on the weekend (thankfully Greenwich is a very dog friendly town), or go to the dog park. Brody makes friends wherever he goes... He's also the BEST snuggler I've ever known. If he's not on my lap, he's on my feet or right up against me. He's still learning not to jump on people, but he just can't help himself when he gets really excited. Most people who get to spend time wtih him love to watch him play with his toys (he can entertain himself for quite some time with just one toy!). My world would not be complete without this little peanut. 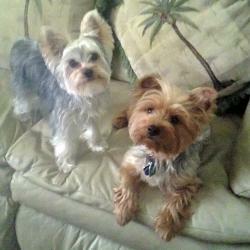 I thank you all at UYR for the AMAZING work you do for these pups! If it weren't for Dianne saving him from certain death and nursing him back to health after his eye was removed, and for Casey who was his second foster mommy, he would not be with me today. I can't thank you all enough! Happy New Year to you, too! It is so nice to hear from you. I just don’t know where the time goes! Sorry I haven’t written sooner. We have been following the site and did notice Talbot and Bear are gone. We are soooo happy to know they too have their forever homes. What can I say about Spider!! He is such a wonderful boy, I can’t find the words to describe him! He is everything we could have hoped for. He is happy, good temperament, minds well, wants to please, loves Annie (and Annie loves him), very affectionate, excellent on the leash . . . .. I could go on and on. All of us are just “in love”. He has fit into our family perfectly. I really didn’t think Annie would play with him like she does, being the “prissy” Shih Tzu she is. Annie and Spider play so well together, and he is so good and gentle with her. He does get a little rough sometimes, but, I think Annie likes it. Annie will put him in his place when he does get rough or takes her toy one too many times out of her mouth. She and Spider play with their mouths, rather than wrestle like he and his brothers did. They both sound like a couple of “wookies” when they get going and get quite verbal and loud. They are just adorable. Then there is the chase. Spider is the more aggressive one and loves to have Annie chase him. Our house is such that they can do laps, and boy do they! Excellent exercise for both of them. We have this huge field next to our property that we take him to. We do about three laps (which I’d say is at least 1 mile). He is in his element! 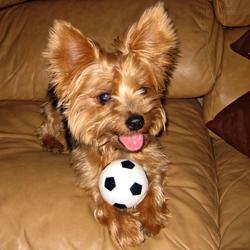 He loves it so much, and just has a ball out there. When we took him to the beach for the first time, everything was new and wonderful. I don’t think he’d ever seen seagulls or the beach and waves. As much as he loves that too, we think he loves the field more. He has become quite spoiled and does expect to be able to go to the field or beach everyday. We feel so lucky and thankful that we found him through you. He is just such a joy and makes us laugh all the time. Before we got him, I told Annie I was going to get her a brother. Instead, I got her a boyfriend! It’s so wonderful that they get along so well and that we will all grow old together. 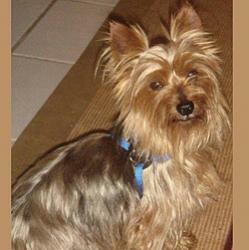 We thank you , and the Yorkie Rescue, so much for him! Rene, I am attaching a couple of pictures. The above is quite lengthy, but feel free to use part or all of it on the website. I hope your work has slowed down for you and you can get a much needed break, and that your family is well. One thing I almost forgot to tell you. He ate an awful lot when he first got here. He has gained about 4 lbs and weighs almost 15lbs. His eating has settled down and he eats twice a day now. He built muscle and is stockier. He looks wonderful, happy and healthy. We've got the perfect boy. We both hit the lottery! He is so sweet. He did amazingly well. He explored the house for a long time and ate all his food and had a treat. When it was time to go to bed, I was worried that he would probably be up all night since he was in a strange place, but he slept next to our bed in a dog bed. He did sleep with us for awhile, but then jumped down. He is sitting on the couch watching me right now. He is such a love. I will definitely send you pictures soon. He seems very attached to me already and he is excited every time my son is around. He still seems a little leery of my husband, but hopefully, that will pass in a few days. Tim is gone till Wednesday for work, so they will have to get reacquainted then. Thanks again for helping us adopt Coco. We love him! Getting along great in my new home! FM sure picked a good fur ever home for me. But I knew I liked my new mommy and daddy right from the start. Fur brother her little men. My new daddy and I play with the toys a lot. I had a great BD party. 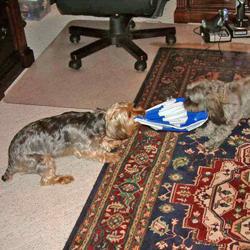 My new fur brother (Baxter) and I play all the time. Baxter is a little older than me. He is 4. I want to do everything my older fur brother does. I even got a hair cut. I like it a lot here cause I have lots of toys and I get lots of bones and my new mommy even gives me some people chicken. My new mommy says I have a great appetite whatever that means? She says I never miss anything. All the time when she visits. I take lots of walks with my new brother, daddy & mommy and car rides too. Thing!!!!! I Get to sleep in the BIG BED!!!! So I am keeping it. 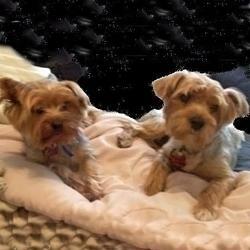 Hope you like the pics of my new fur brother and me. 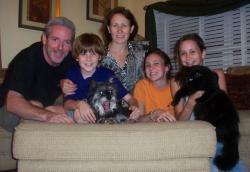 Dorrie with her FURever Family! Dorrie has been in her FURever home for a month now. Foster Mom and Dad say that she is just fantastic and that they adore her; saying that Dorrie has really made herself comfortable in her new home. She has even won over Pearl, the family kitty cat. 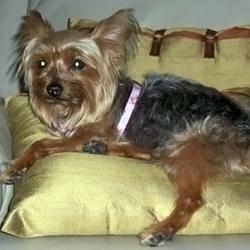 They want to thank United Yorkie Rescue for bringing Dorrie into their lives! 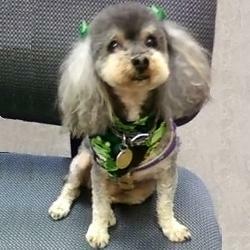 What a happy ending, for a little girl who was brought into a high kill shelter in a pot from Home Depot, with large mammary tumors and itchy skin - fast forward a few months to a beautiful ending to a not-so-happy beginning. 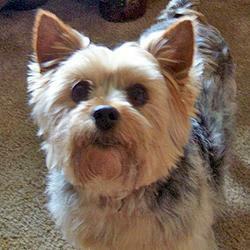 We all just love happy tails stories!